This report examines the history of Alberta energy policies as they apply to development of the oil sands, focusing on the contrasting oil sands policies of premiers Lougheed and Klein, two of Alberta’s most popular premiers and key to oil sands development in the province. The petroleum industry has long had a strong influence on the pace and scale of development, but its influence was tempered by the policies of Peter Lougheed, who was Alberta’s premier from 1971 until 1985. Lougheed saw government as a counterweight to the economic power and influence of the petroleum industry. Lougheed also believed the oil sands were key to Alberta’s long-term prosperity, so his government used all the power and money it had at its disposal in the 1970s to kick-start oil sands development. Ralph Klein became premier in 1992, only seven years after Lougheed’s departure. He wanted government to step aside so the oil sands industry could promote development on its terms. Klein believed that freeing up the industry would increase private investment in the oil sands and generate well-paying work for Albertans. The policies adopted by Klein and his cabinet were a bold departure from the way Lougheed had envisioned oil sands development. By examining the distinct policies of these two Progressive Conservative premiers it also becomes clear that Rachel Notley’s NDP government leans more to the Lougheed model than the Klein model. 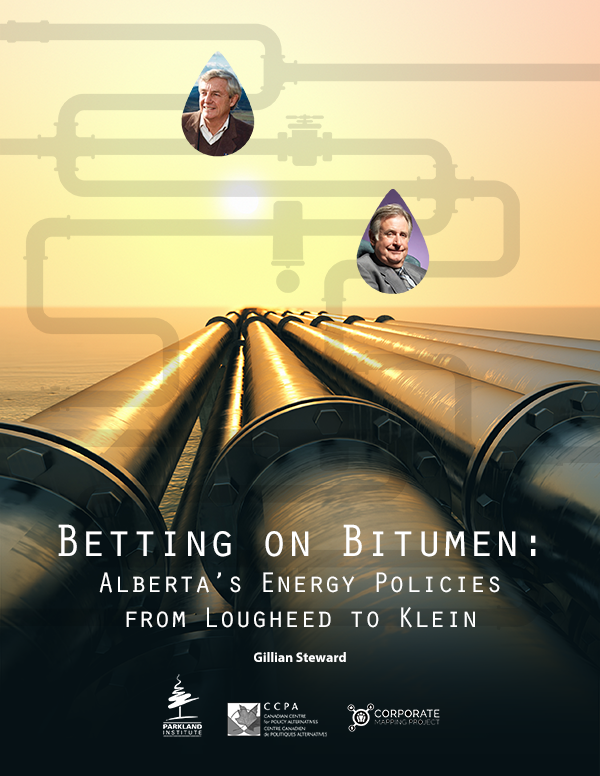 Betting on Bitumen was published by Parkland Institute and the Canadian Centre for Policy Alternatives as part of the Corporate Mapping Project, a research and public engagement initiative investigating the power of the fossil fuel industry in Western Canada. The CMP is jointly led by the University of Victoria, the Canadian Centre for Policy Alternatives, and Parkland Institute. Gillian Steward is a Calgary-based author and journalist. She currently writes a regular column for the Toronto Star and teaches journalism at Mount Royal University. She was the managing editor at the Calgary Herald from 1987 to 1990, and was the publisher/editor of Alberta Views magazine in 2006/07. In 2014 Ms. Steward completed a PhD in Communication Studies at the University of Calgary.